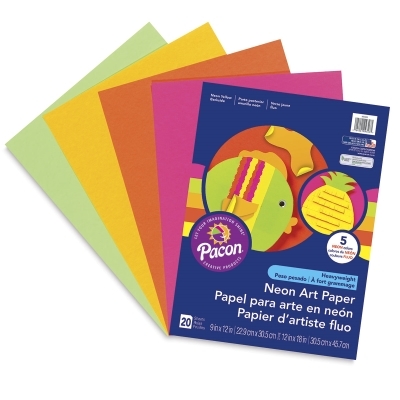 Pacon Neon Art Paper is a heavyweight, all-purpose art paper that comes in a 20-sheet package, five sheets each of Neon Yellow, Neon Green, Neon Orange, and Neon Pink. Individual sheets measure 9" × 12", and are backed with yellow. ® Pacon is a registered trademark.® Neon is a registered trademark.